This recipe is an adaptation of this recipe over here. If you need help learning how to scald milk, watch this video this video. Grease and sugar four 6-ounce ramekins. In large mixing bowl, beat butter, sugar and vanilla until light and fluffy. Sift together flour, cocoa and baking powder. Add alternately with milk mixture to butter mixture. Beat 1 minute on medium. Divide batter evenly among ramekins. Place ramekins in an 8-inch square pan. Pour hot water in bottom of pans to ⅛ inch deep and place pans in oven. Bake for 45-50 minutes or until toothpick inserted comes out clean. Remove pans from oven and let ramekins stand in water for 5 minutes. Remove ramekins from water and let cool slightly. You can serve in dish or invert onto dessert plates. 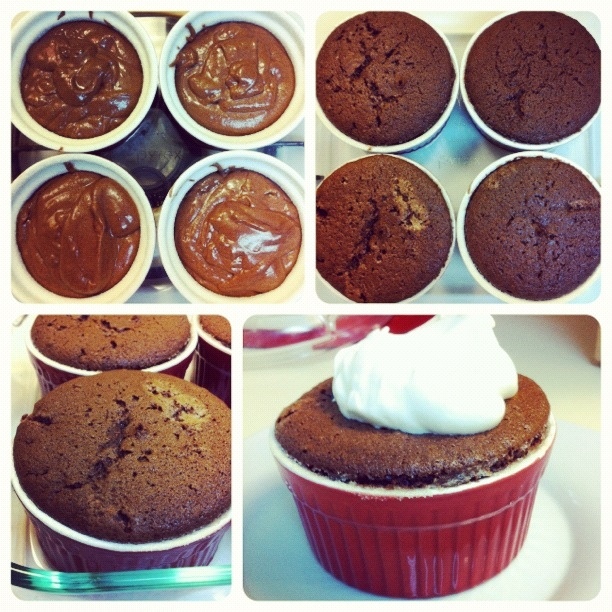 For topping: beat whipping cream and powdered sugar in small mixing bowl until stiff and spoon onto warm soufflés.